New IDC research commissioned by Avaya finds more than two-thirds of companies rate digital transformation efforts as less than extremely successful in achieving their goals, with only 19% driving true innovation. If digital transformation (DX) is using digital technologies to create new business models and change markets, then the journey has only just begun according to a new IDC white paper commissioned by Avaya.1 The study of nearly 800 enterprise companies across 15 countries showed this and other constructive insights for organizations planning their transformation strategies. The study found that 69 percent of respondents rate their DX efforts to date as less than extremely successful in meeting their goals. Only 19 percent believe they’re truly innovating as a result of their initiatives. Survey results suggest that one of the primary reasons for this perceived lack of innovation is that most companies are still in the early stages of the transformation process, even though they are well into DX discussions. The evidence also suggests that these early efforts are largely focused on implementations and refreshes of individual technologies, instead of strategic modernization. Optimally, the individual technology deployments should be steps in the larger plan to achieve the overall goals and objectives of the DX strategy. Regarding drivers for DX initiatives, even though a transformed customer experience is widely discussed as the desired outcome, responses suggest that employee productivity is currently prioritized by 62 percent of companies, versus 54 percent that have prioritized the customer experience. To put it together, it appears that the current state of DX leans toward individual technology refreshes focused on internal efficiency objectives. This does not mean that the internally focused efforts are not well designed, but simply reflects that plans are still in early stages, starting with a foundation of internal improvements. While any organization will welcome the resulting cost efficiencies and internal productivity gains, those focused on growth should not stop there. The study found that revenue growth at companies with digital transformation strategies encompassing both customer and employee experiences surpassed those with their vision limited to cost reduction. While the results also showed that companies focused more on the customer experience over expense reductions had the highest revenue growth, the internal-first approach may ultimately be faster and more effective in achieving customer experience objectives than starting with front-end or customer-facing processes. Transformations driven from the inside out — first aligning people, tools and processes to create an environment that supports the desired customer journey — are likely to provide a solid path to the customer satisfaction and loyalty that drive lasting growth. Download your complimentary copy of Digital Transformation: Insight into Getting it Right! 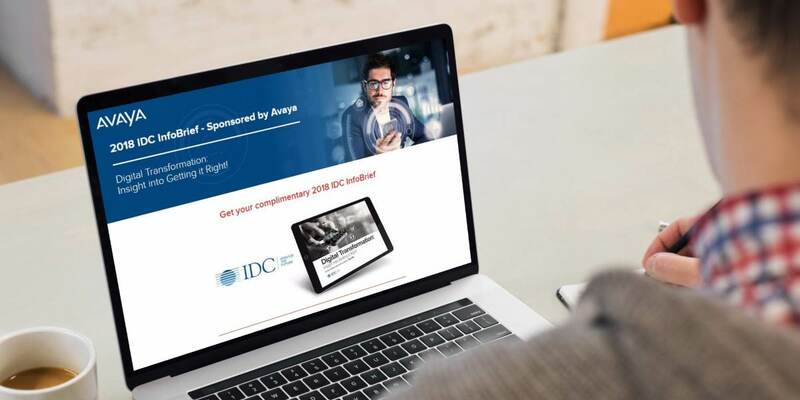 the 2018 IDC InfoBrief Sponsored by Avaya.